Six weeks at sea and we still wake asking ourselves whether this life of doing what we like, when we like and where we like is real! It is proving a magic experience. We left the Hamble at 18.30 on Mon 5th July, anchoring off Hurst Point, just inside the Western arm of the Solent for the night. We crossed to Alderney in the Channel Islands next day and had a day off saying our good-byes to one of our most precious sailing places. 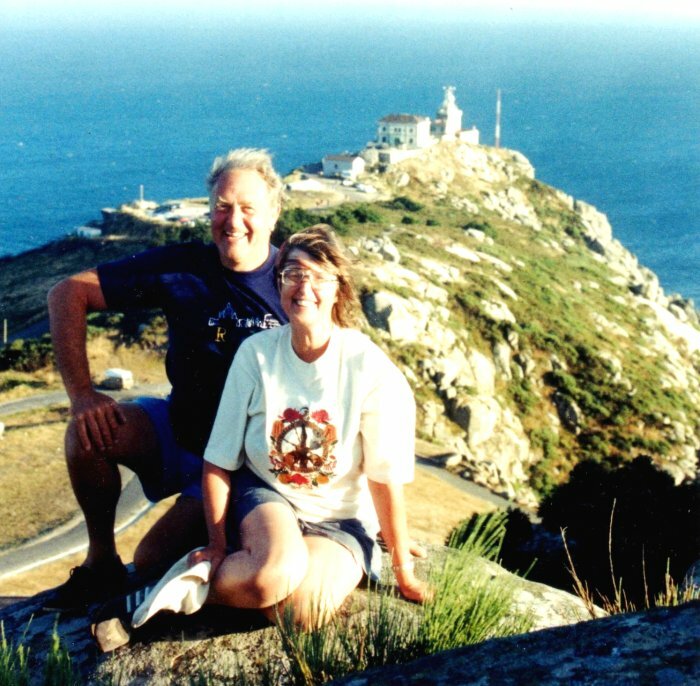 The next leg, a four day passage direct to La Coruna on the Northwest coast of Spain took us across the Bay of Biscay. After looking like a lamb, the Bay woke up and gave us a nightor so of gales, just to re-establish it's reputation. Since then, we have cruised slowly down the Galician coast, calling in at all the Rias (flooded valleys). They are all charming, with wooded hillsides strewn with large granite outcrops. They are larger than we had imagined with more and bigger towns. The people are warm and friendly, speaking virtually no English which has enabled us to enhance our Spanish to a fast limping pace. A typical day encompasses a morning visit to the local market to provision but mainly to stock up with mariscos (seafood), fish and of course the local wine (no label). Of course we keep re-meeting many of these and other friends so there are lots of catching up sessions, often at the inevitable beach BBQ. We enjoyed numerous re-encounters with Patrice and Michelle, from Nantes, on Brandywyn with daughters Emma and Louise. There have been two other special meetings. 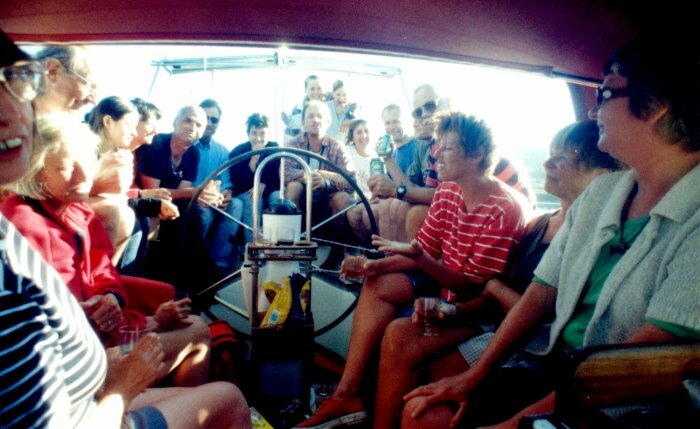 The first with Terry and Margaret Grisley who we have sailed with for twenty years. They were in company with two other boats from the RAF Yacht Club. The second was a visit for ten days from our younger son Paul and girlfriend Emma. That was very special, to be able to share our experiences with them for the first time. They will join us again in the Caribbean in March, before Emma does her three month elective (medical) on Tobago. Galicia is a wonderful area, not much visited by the British (the Swiss and of course Germans are here in numbers). The culture is rich and people very friendly and helpful. 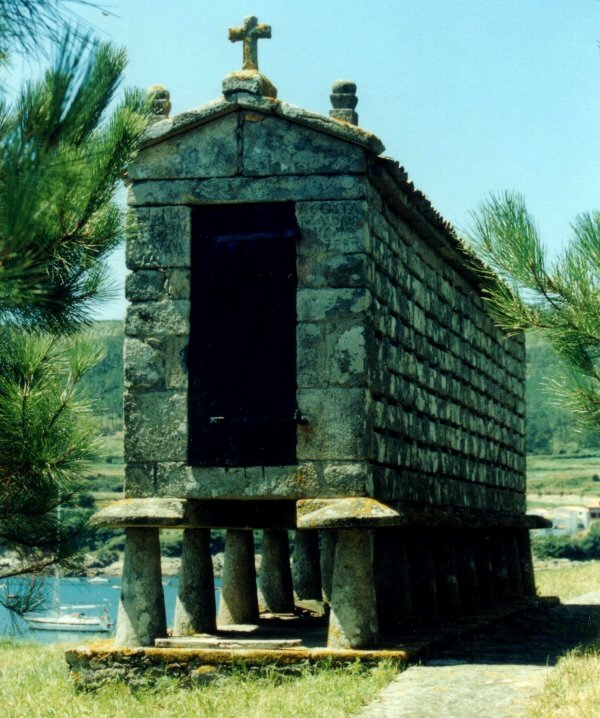 We have made a couple of inland excursions to Santiago de Compostela (a major site of religious pilgrimage, third only to Jerusalem and Rome) and to Pontevedra (Roman town and local centre of government). A common feature of the landscape are the horreos, stone built storage for corn and other crops. Me-thinks they may have a rodent problem. Our favourite place so far has got to be the Ilas Cies (Islands of God) which straddle the entrance to the Ria de Vigo. They have steep rocky hillsides, covered in forests of pine and eucalyptus and of course extensive beaches of coarse white sand. We spent three days walking, swimming and lazing in this paradise. What a pity the islands succumb to the Northern European winter, or going to the Caribbean would be unnecessary. The next leg down the Portuguese coast is very different. The land is lower with river estuaries, much too shallow for Amoenitas's 2.3m draught. (it has grown by 0.1m thanks to all the round the world kit). We are therefore planning just two major stops at Porto and Lisboa which are both of great architectural and historical interest. Cadiz is worth a visit before we enter the Mediterranean. We have a nostalgic mission then to anchor again off the castle at Tarifa at the mouth of the Med. We stopped for the night there bringing Amoenitas back from Malorca. Thence to Gibraltar where we hope to meet up with old friends from Roke, Dave (006.5) and Pat Bond who are cruising on the Orianna. Then to Madeira where we will meet up with neighbours Roger and Barbara Ravenscroft and some old friends we made way back in our Yorkshire, days, Doug and Margaret Emmott. We plan to be in the Canaries for around mid-October. Older son Bruce and girlfriend Tracey and possibly Di's Mum hope to join us there. We plan leave to cross the Atlantic to St Lucia on about the 20th November. We should be downing our first rum in the Caribbean around the 14th December.